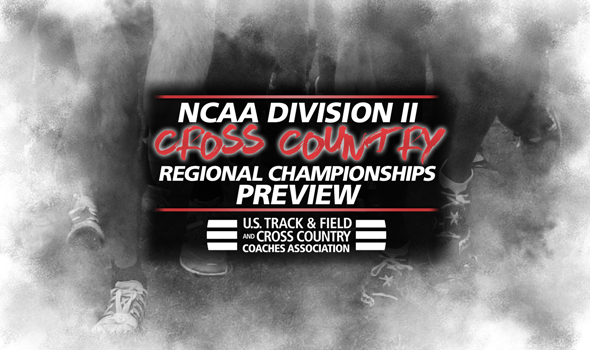 What a weekend we have on tap for NCAA Division II Cross Country as the sport gets ready for regional competitions! The best teams in the nation will take to courses around the country for the running of regional championships this Saturday, November 17 and each program has just one goal on its mind; qualify for nationals. Remember, the top three teams from Saturday’s eight regional championship races will earn automatic qualification in the NCAA Division II Cross Country National Championships slated for December 1 in Pittsburgh, Pennsylvania. Ten more teams will also be selected to join them during an at-large process by the NCAA Division II Men’s and Women’s Cross Country Committee for a grand total of 34 programs. Individuals will be looking to advance to NCAAs too as after the 32 selected teams have been determined, a minimum of 24 additional individuals will be selected per gender to also participate. Complete ways for athletes to earn a selection as an individual can be found here. Keep reading to take a look at some of the best regionals the sport has to offer this weekend along with ways on how to follow the action nationwide. The South Central Regionals are absolutely stacked as the meet will feature seven top-25 ranked men’s and six top-ranked women’s programs. Included in that number is three of the top-five teams on the men’s side and four of the top-nine on the women’s. Adams State has been the top-ranked men’s team in the South Central for all eight regional rankings this season. They are the first program in the South Central to hold the top spot for a full year since the same Grizzlies accomplished the feat during the 2014 season. Adams State went on to win the national championship that year. Adams State won a tightly-contested regional by a 35-38 margin last season and have won the regional crown in five of the past six years. The only other program to win during that streak was Colorado Mines in 2016. Adams State, Colorado Mines and Western State all punched automatic bids to NCAAs at last year’s regionals. Adams State, Colorado Mines, Western State, CSU-Pueblo and UC-Colorado Springs just did battle at the Rocky Mountain Athletic Conference (RMAC) Championships in early November. The Grizzles took home the top prize with 30 points and were followed by Western (71 points) and CSU-Pueblo (109). The Grizzlies have also sat atop the women’s regional standings all season as well. Adams State has remained atop the region for 51-straight regional rankings dating back to the beginning of the 2012 season. Adams State ran away with the region title last season after posting a 26-point performance. The Grizzlies are looking for their seventh consecutive regional championship since joining the South Central in 2012. Colorado Mines (second overall/82 points) and Western State (third/87) joined Adams State as automatic NCAA teams last year. The women’s programs of Adams State, Western State, Colorado Mines and UC-Colorado Springs also competed at the RMAC Championships. The Grizzlies took the team victory with a 27-point showing while Western took second (39 points) and Colorado Mines came in third (99). Fans call follow along with the results at the championship central page here (including live results at this link). The men’s 10K race is set for 10:30 a.m. MST and will be followed by the women’s 6K event at 11:45 a.m. MST. While the South Central might have a few more of the top-ranked programs, the West Regionals will host the most top-25 ranked teams at any regional meet this weekend as six nationally-ranked men’s and eight women’s teams will compete against one another for a chance at NCAAs. The men’s side features three of the nation’s top-11 programs while five of the top-13 women’s teams will also be in attendance in what will be another exciting race with great depth. Chico State has led the West for all eight eight regional rankings this year, a position it has been in for 21 consecutive weeks. The last time the Wildcats weren’t No. 1 was the preseason rankings of the 2016 season. Chico State has captured the regional title the past two years and five of the last six. Cal Baptist and Western Oregon also earned automatic NCAA bids last season with a second and third place finish at last year’s regional. Some of the top teams in the region just met at the Great Northwest Athletic Conference (GNAC) Championships in which Simon Fraser, Alaska Anchorage, Western Washington and Western Oregon were in attendance. Alaska Anchorage claimed the win with 46 points. They were followed by second-place Simon Fraser (54 points) and third-place Western Washington (60). The women’s team from Chico State has also sat atop the rankings all year as well. The Wildcats have captured the regional crown in two of the past three seasons and have finished in the top-three at the regional meet in 11 consecutive years. Cal Baptist won the regional meet last season with a 68-point performance. Alaska Anchorage and Chico State joined the Lancers at NCAAs after placing second and third, respectively. The women’s teams of Alaska Anchorage, Simon Fraser, Seattle Pacific and Western Washington all toed the line at the GNAC Championships. Alaska Anchorage collected the victory with a 49-point performance. They were trailed by Simon Fraser in second (60 points) and Seattle Pacific in third (64). Top-ranked Chico State won both the men’s and women’s titles at the California Collegiate Athletic Association (CCAA) championships. Fans can follow along with the live results of the West Regionals here. The men’s 10K race will get the meet started at 9 a.m. PST while the women’s 6K will follow at 10:15 a.m. PST. The Midwest Regionals will feature a strong batch of teams in both the men’s and women’s races. The men from Grand Valley State will look to keep its hold on the region, one in which the Lakers have claimed the past 16 regional titles in. Grand Valley State has also been selected as the No. 1 team in the region for the entire season, a spot they have held since the USTFCCCA regional ranking data became official before the 2010 season. Grand Valley and Saginaw Valley State just went head-to-head at the Great Lakes Intercollegiate Athletic Conference (GLIAC) Championships with the Lakers edging the Cardinals by a 19-55 margin. Malone and Walsh did the same at the Great Midwest Athletic Conference Championships with the Pioneers earning a strong victory on the Cavaliers home course. Southern Indiana and Lewis also earned automatic bids to NCAAs a year ago. Like their men, the Grand Valley State women’s program has also been the top team in the region for the entire year. The women’s dominance of the region is even better than the Laker men as the women are looking for their 18th consecutive regional championship. They have also held at No. 1 in the Central since the week five rankings of 2015. Grand Valley State just knocked off Michigan Tech at the GLIAC Championships by a 17-71 point differential while Walsh won the program’s first Great Midwest Athletic Conference championships with 34 points. Hillsdale and Walsh joined Grand Valley State at last year’s NCAAs with automatic bids. Fans call follow along in real time with the live results of the Midwest Regionals here. The men’s 10K race will get the day started at 10:30 a.m. CST and the women’s 6K will follow at 11:45 a.m. MST. The Central Regionals will feature a strong battle on the men’s side between three teams in the top-14 while the women’s race will be one of the deepest in DII this weekend. To touch on the men’s race, all three nationally-ranked teams are favored to advance to nationals. Sioux Falls just took over the top spot in the Central after its performance during conference championships weekend. It was the second time in program history the Cougars were ranked No. 1. Sioux Falls. Sioux Falls, Missouri Southern and Augustana have all held in the top-three of the region in some capacity for the entire 2018 season. Sioux Falls and Augustana are fresh off competing against one another at the Northern Sun Intercollegiate Conference (NSIC) Championships in which the Cougars knocked off the Vikings by a 32-53 margin. Augustana has won the regional meet in six straight years though. Missouri Southern won the team title at the Mid-America Intercollegiate Athletics Association Championships. Augustana, Missouri Southern and Central Missouri picked up automatic bids to nationals last season. The top spot on the women’s side belongs to U-Mary who has held at No. 1 for all eight regional rankings this year. The Marauders are coming off a win a the NSIC Championships after posting a near-perfect score of 16 points. U-Mary is looking for its third consecutive regional crown. Augustana came in second at the NSIC Championships with 54 points. Pittsburg State and Southwest Baptist duked it out recently at the Mid-America Intercollegiate Athletics Association Championships. The Gorillas posted a score of 26 points to win their second straight conference title while Southwest Baptist finished as the meet’s runner up. Oklahoma Baptist won the Great American Conference Championship. U-Mary, Pittsburg State and Augustana were the automatic qualifiers out of the region a year ago. Fans of the Central Region will be able to find results of regionals here. The men’s 10K race will kick things off at 10 a.m. CST while the women’s 6K event will go at 11:15 a.m. CST. Fans of the Southeast will be spoiled this weekend as this regional is one of the few in any division of cross country with live on-site coverage. Live results can be found here while fans will be able to access live video of the meet through Facebook here or Youtube at this link. Fans of the South will be able to find live results of their regional at this location. Atlantic Region fans can follow along with the results of their meet here. Any live coverage of the East Regionals are still to be determined.